On My Bookshelf, No. 6 – The Bookshelf of Emily J.
I have what builders call a “plant shelf” in my master bedroom. When my husband and I first moved into our home thirteen years ago, I had no idea what to put on that shelf. I tried some leftover wedding flowers and random plants, but it didn’t look good at all. As I began collecting books, because I finally had a place to store them, I realized that they would look good on this plant shelf. For the next few months, I’m going to share with you the titles of the books that are on this plant shelf, ten at a time. On it, I keep books that I’ve read and liked more than other books. (You could even say that most of these are favorites.) I find their presence there comforting. I recognize them, even without being able to see the type or the title, from their colors and heights and placement. They are my friends. 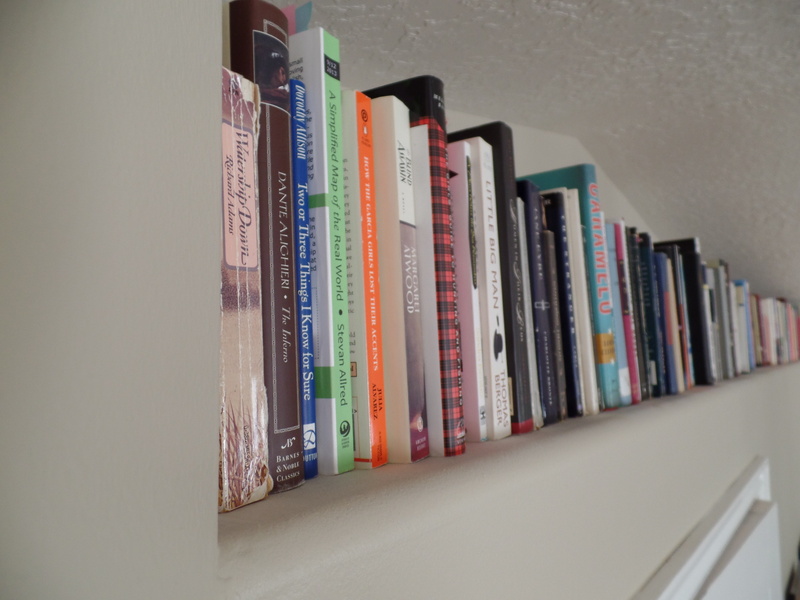 And sometimes, when I’m feeling particularly lonely or self-pitying, I look up and remember that I have many friends, and all of them wait for me within the books of this shelf. I have previously posted about my many bookshelves here and here. Today’s set of ten (not very colorful) books are the following. 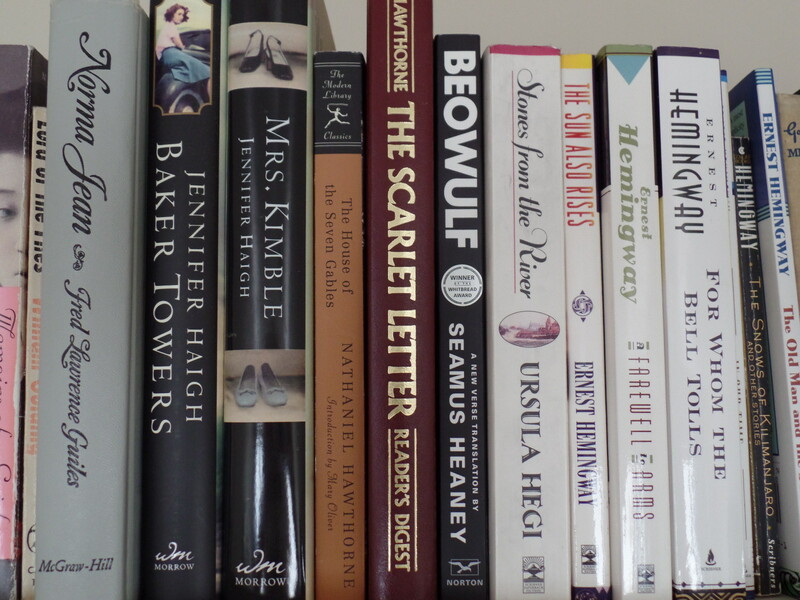 As you can see, there will be more mention of Hemingway next time I post about my bookshelf. Have you read any of these? I have read The Scarlet Letter and Beowulf (in the Middle English as well). I really enjoyed them both for totally different reasons with are apparent. The Scarlet Letter I loved for the history, horror, romance and the way Hawthorne writes. Beowulf because I loved the study of the Middle English language and the Nordic tales-he was a true King in his time and a poetic hero! Amazing reads! Very cool that you’ve read Beowulf in Middle English! I ended up learning some of that when I read Chaucer for an undergraduate seminar, but I never had to read it with Beowulf. Did you see the movie? Is it any good? I’m debating on whether or not I want to see it. It came out a few years ago. Think I’ll try to find it on my amazon fire! Thanks! Interesting idea. My bookshelves are quite messy, so I wouldn’t want to show them right now. I just don’t have the room for all of my books. That’s something I don’t have. I do have a pile next to the bed, but it’s a bunch of Japanese textbooks I haven’t finished. I have that same version of Beowulf and reviewed it awhile back! Very good! Haven’t read The Scarlet Letter since high school, I’m afraid. And Stones from a River a long time ago, although I remember I liked it. Heavy on the Hemingway, though. I’m not such a Hemingway fan myself. I read once that he is so popular just because his sentences are so simple that any foreigner can read him without difficulty. I thought that was an interesting way to look at it. But maybe I don’t like him just because personally he was a macho jerk. Still, I’ve probably read all of your Hemingway at one time or another. I prefer his buddy Fitzgerald (who had his own problems). I’m not familiar with Jennifer Haigh. I love Jennifer Haigh, or at least I did in my early twenties! I would highly recommend Mrs. Kimble. As to Hemingway, it seems that I got to appreciate him through a seminar I took devoted to him. I wouldn’t say I’m a huge fan. I just happen to know an awful lot about him and his work. Yes, he was a macho jerk! I didn’t read The Scarlet Letter until my mid-twenties. Somehow, my high school missed it. I will look into Haigh. Thanks! I’ve read the two Hawthorne and all the Hemingway. I was the nerdy (only?) girl in high school who totally loved The Scarlet Letter. I remember it was the first time I realized that stodgy old books written in funny old language could be really good stories. I read House of the 7 Gables last year and while it was a bit challenging to get into I did enjoy the story. I read as much Hemingway as I could just to figure out what the big deal was and found that the big deal was totally lost on me. I’m really interested in Beowulf, mostly because someone recently recommended Grendel, a new book that is the monster’s story. Is Seamus Heaney’s translation a good one? It might be fun to read those in reverse order. Grendel first, then Beowulf. Yes, the Heaney translation is a good one. I remember hearing about Grendel. Is that a children’s book? I never ended up reading it, and yeah, I thought it was fairly new too. Maybe it just got some recent attention with the Heaney translation and the movie? The Heaney translation is my all-time favorite. Really good stuff. If three people agree it’s irrefutable fact, right? It is – indeed – the best Beowulf translation hands-down and second to none. Hi Emily! I like reading books but not in novel or other literatures. Yet, I want to start getting myself used to with those readings. Do you have any recommendation which book I should read as a start? Thank you! This is a hard one! Maybe start with some children’s or young adult novels. I love the Ramona series by Beverly Cleary or Wilder’s Little House on the Prairie series. My daughter and I are reading a great one right now called My Side of the Mountain. Good luck! Looks like we found your Hemingway section. I look forward to your post on his work and your favorites. I did a whole week of Hemingway posts a while back. He certain takes up some space on my shelf! Agreed! She was the best character. Glad you experienced both the book and the movie. I have read The Scarlet Letter a number of times. I don’t know what it is about that story, but it’s one of the few I’ve made time to re-read in life. I teach Beowulf, much to my delight (but maybe not my students’!). But Hemingway. Hemingway is my Achilles Heal. Hemingway is my favorite writer of all time. Such simple sentences. Plus, I wish he was my boyfriend back in his Paris days. Ha! I have secretly wished he was my boyfriend too, but then I remember what a jerk he was to Hadley and reality brings me back. I bet someday your students will look back and appreciate Beowulf. You just gave me a great idea for a new bookshelf! Oh good! I would love to see it. I LOVE Beowulf, and Hemingway. Snows of Kilimanjaro is my absolute favorite. Ugh, it’s just so great! And I read the entire Old Man and the Sea one time, sitting in the doorway of the feed room at the barn last December. That was good. Those are good ones! I am glad I am not alone in my appreciation of Hemingway. Hawthorne and Hemingway, two authors I’ve always wanted to read. You’re only fanning the flames of my motivation. Read them! I think they are a must-read, even if you end up deciding you aren’t that into them. I just finished The Paris Wife which is actually about Hemingway. I have never read any of his books! Definitely adding it to my TBR list. Hawthorne is one of my favourites and I love The Scarlett Letter. I liked The Paris Wife! I have a review of it somewhere on my blog. I also enjoyed one about the Fitzgeralds called Zelda. That is a fun genre. Excellent selection! I’m glad I discovered this blog!